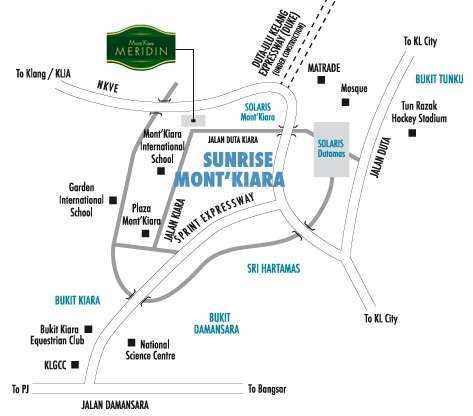 Mont Kiara Meridin is the newest member of the Mont Kiara residential offering exclusivity and high class living in the Sunrise Development family. Mont Kiara Meridin is built on 2.3 acre of freehold land and was completed in January 2009. Mont Kiara Meridin features modern architecture with an overall look of white and glassy. This residential is a 31-storey block building with 2 wings housing 216 condominiums and 12 suites bringing a total to 228 units. Each unit is equipped with water heaters, air conditioning, shower screens, kitchen cabinets and also LCD panels in the master bedroom. The standard unit sizes ranges 1,787 to 2,513 sq ft. while the suites have built-ups up to 4,487 sq ft. There are a few exclusive amenities nearby Mont Kiara Meridin. Plaza Mont Kiara is famous for its flea market on Saturday and Thursday evenings as well as chic restaurants. International schools are also located near the residential which is just within a walking distance.